Sounds great, right? Especially to the critical care domain where data is extraordinarily dense, time is our greatest opponent, and fiscal concerns represent an annual cost to the U.S. economy in excess of $260 billion and approximately 40 percent of total inpatient costs. But what if health care analytics and clinical decision support (CDS) could combine to deliver rapid bedside diagnostics or upstream health detection capabilities? That is to say, a tool that provides first responders, clinicians, hospital staff, home care providers, and patients with clinically relevant, patient-centric information, intelligently filtered and presented at appropriate times to transform care delivery. Historically, CDS applications have operated as components of comprehensive electronic health record (EHR) systems—in other words, retrospective data repositories or order entry systems with limited data streams that are, at best, semi-real time. However, the next generation of CDS tools seeks to incorporate advanced data processing systems capable of discovering and harnessing actionable insights from all varieties of medical data, and leveraging these insights for diagnostic, predictive and prescriptive capabilities. In a nutshell, this next gen CDS tool will aggregate disparate patient health information—static and real-time—across care delivery touchpoints for analysis and optimization, enabling clinicians to make faster decisions and implement personalized, patient-centric treatment options at the point of care, whether that is the home, ambulance, hospital or battlefield. Ultimately, such a solution could have the power to save a life, elevate care delivery, reduce length of stay, improve quality of life or predict and avoid a critical health event altogether. 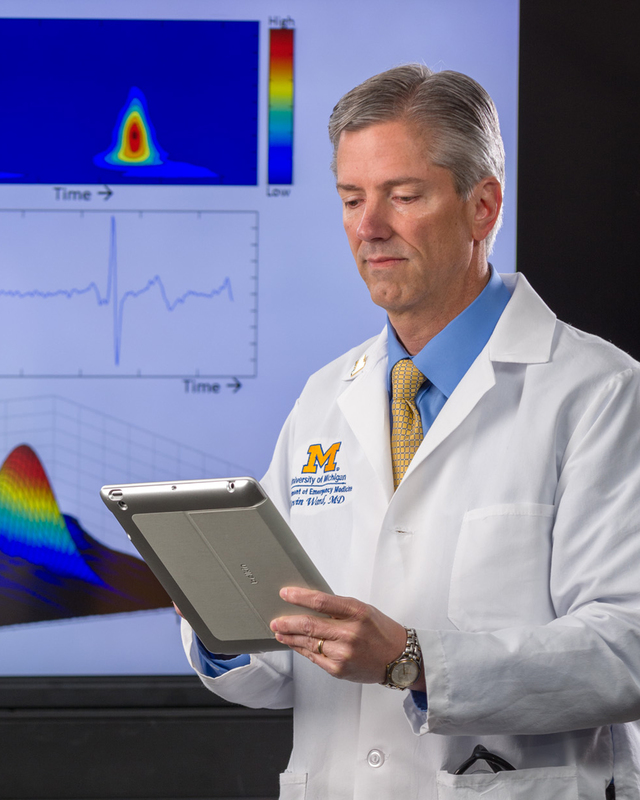 To many, this sounds almost like science fiction, but probable with the help of a small village—or in our case, a team of digital health partners comprised of world-class researchers like those at the University of Michigan, advanced analytic technology products, wearable and anti-wearable sensors, and mobile and connected health solutions. Healthcare has lagged behind the retail and financial sectors in the use of big data and digital technologies but the gap is closing and closing fast. The risks are high, but manageable through the teaming of digital health partners, and worthy of such a high-impact payoff. Data is king and the more hard evidence we have the better decisions we can make as clinicians, patients, families, providers, payers and industry alike. Kevin R. Ward, MD is the Executive Director, University of Michigan Center for Integrative Research in Critical Care and Professor of Emergency Medicine, University of Michigan Medical School. This entry was posted in Uncategorized and tagged AirStrip, CDS, clinical decision, Clinical Decision Support, clinical transformation, clinician workflow, clinicians, data, data analytics, decision-making, health, health IT, healthcare, hospitals, mhealth, mobile patient monitoring, Patient, patient care, patient data, patient monitoring, physicians, solutions, technology, University of Michigan, workflow. Bookmark the permalink.